Samsung's (SSNLF willingness to pull out all the stops to boost its flagging high-end smartphone sales apparently go beyond just launching a foldable phone. On Tuesday, The Wall Street Journal reported that Samsung, which in recent years has been launching two versions of its flagship Galaxy S phones, plans to launch four versions of the Galaxy S10. Three phones with display sizes ranging from 5.8 inches to 6.4 inches will reportedly launch in February, while a fourth phone, codenamed "Beyond X", due in the U.S. and South Korea in the spring. The details shared about the "Beyond X" phone have gotten a lot of attention: The device will reportedly have a 6.7-inch display, pack a 5G radio and also contain six cameras -- four in the rear and two in the front. One has to assume that Samsung, which raised some eyebrows in August when it announced that the Galaxy Note 9 will feature a $999 starting price, will charge a premium for this feature set. The WSJ adds that some of Samsung's Galaxy S10 phones could also have a feature called reverse wireless charging, which would allow the S10 to charge other devices by placing them together. It's fair to wonder if many consumers will find some of the Beyond X phone's features to be overkill, at least for now. While the arrival of edge-to-edge displays has made it easier to pack larger screens onto pocket-friendly phones, 6.7 inches is still pushing it. 5G enables faster download speeds, due to both higher peak download speeds and greater network capacity. But building out networks will take time -- there's a reason why the Beyond X is reported to be launching in just the U.S. and South Korea -- and there are lingering concerns about thickness/weight and battery life for first-gen 5G devices. And while having four rear cameras would in theory be useful -- among other things, it could allow for four different zoom lengths, enable a powerful optical zoom function and improve background blur/bokeh -- getting all four cameras to deliver stellar image quality could be a challenge. A few Android OEMs have already launched phones with three rear cameras -- reviewers have found some of the phones to have better cameras than others. Regardless, it's hard to blame Samsung, which is also looking to launch more feature-rich mid-range devices, for trying to push the envelope for feature sets delivered by its high-end devices, whether by launching foldable phones or ones with six cameras. The company's phone business has had a rough 2018, with lengthening smartphone upgrade cycles, tough high-end competition from Apple (AAPL - Get Report) and challenging mid-range competition from Chinese OEMs all taking a toll. In Q3, even though the Note 9 was released three weeks earlier in the quarter than the Note 8 was a year earlier, Samsung's mobile hardware revenues fell by 12% annually to KRW23.99 trillion ($21.3 billion). 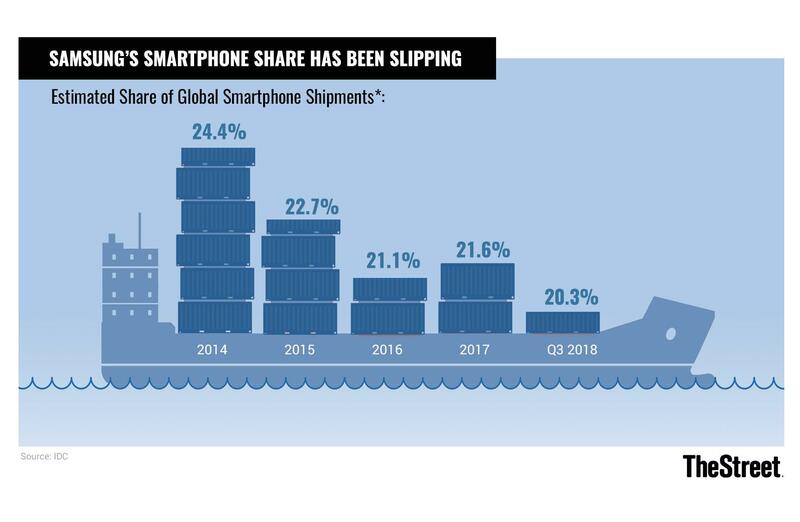 And research firm IDC estimates Samsung's smartphone shipment share fell by 1.8 percentage points annually to 20.3%. However, while smartphone upgrade cycles are clearly lengthening, high-end buyers have shown a willingness to pay more for their devices when they finally do upgrade. The prices that Samsung, Apple, Alphabet/Google (GOOGL - Get Report) and others have recently attached to their flagship phones all bear this out. With high-end phone buyers needing more convincing to pull the trigger on an upgrade, but also increasingly comfortable paying top dollar once they are convinced, it makes sense for Samsung -- and perhaps also some other OEMs -- to roll out phones that pack everything but the kitchen sink, and are priced accordingly. Various mobile suppliers would benefit if Samsung and others get more aggressive about bolstering the hardware feature sets of their devices. OLED materials and patent-licensing firm Universal Display (OLED - Get Report) benefits, for example, when OLED display sizes increase. And though it doesn't count Samsung's phone unit as a client, Sony's (SNE - Get Report) image sensor unit benefits as the number of cameras going inside of the average phone increases. Meanwhile, Qualcomm (QCOM - Get Report) benefits from 5G phone launches, as do RF chipmakers such as Skyworks (SWKS - Get Report) , Qorvo (QRVO - Get Report) and Broadcom (AVGO - Get Report) . Qualcomm has landed design wins for its Snapdragon X50 5G modem with over a dozen Android OEMs. Just how much of a benefit these suppliers get from the launch of new, feature-packed phones will of course depend a lot on how consumers respond to them. However, given the current state of the smartphone market, odds are good that Samsung isn't the only major phone OEM hatching plans to launch and promote such hardware.